Today is International Women's Day and A Day Without A Woman. 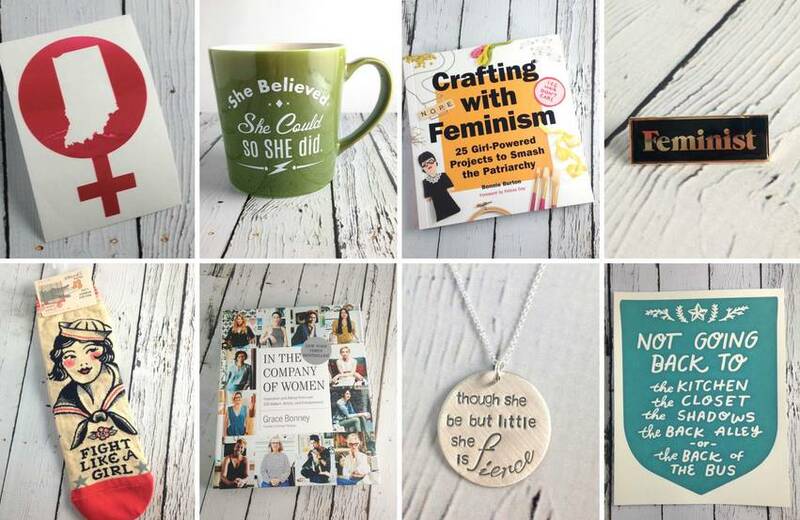 We are celebrating our love of ladies with some of our favorite feminist gifts and shopping at our favorite women run businesses (see below)! Grab some feminist related items here. Or if you want to get something we carry made by women, grab anything by Evan Knox, Amber Bryce, Molly M, Hawkhouse Jewelry, Marcy Davy, Crimson Tate, Sunday Afternoon Housewife or Twigs & Twine. And that's just a small sample of the companies/artist we carry that have lady bosses! Don't forget to hit up Crimson Tate, Boomerang, Best Chocolate in Town, Nurture, Just Pop In, and Patachou just to name a few! Girl Power! Hi! We love that button too! The folks at The Pin Cause https://pincause.com/ made those. I wish they could make bumper stickers! You should ask them to do so!!! Or window stickers!! Hi there! I've already purchased a few of your awesome women's march buttons and was wondering if you would consider making them into bumper stickers as well? I'd love to have one for my car!